Maybe it’s when you’re entering under the towering eucalyptus trees, ambling through the sunken rose garden or savoring the lavender fields blowing softly in the breeze—at some point during your tour of Napa’s Gabrielle Collection Vineyard, it will hit you: You’re in love. 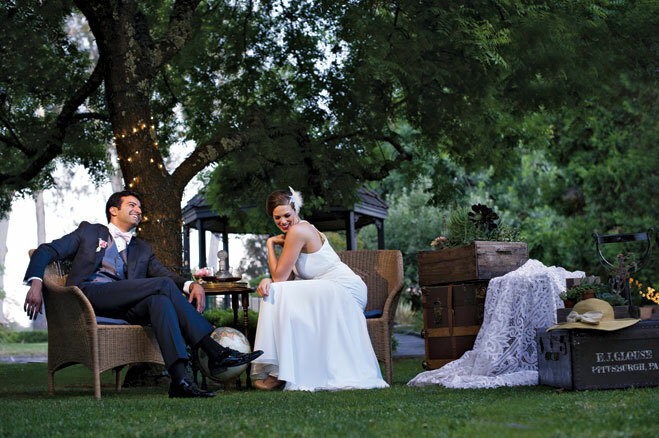 Luckily, the new wedding program brought to you exclusively by River Terrace Inn and Restaurant Cuvée makes it possible to seal the deal at this boutique vineyard. Located in the heart of Napa Valley, Gabrielle Collection Vineyards is the 11-acre property owned by Wayne and Gabrielle Leonhard. The winery, which is family owned and operated, originally belonged to Gabrielle’s grandfather, Pietro, who traveled from Italy to begin making wine in California. The vineyard is known for its small-lot artisan Cabernet Sauvignons. And with the property’s myriad picturesque locales, it takes little effort to set a perfectly magical scene on your wedding day. Brides who choose Gabrielle will work with pros such as Mary Beth Salmieri to ensure wedding plans are executed flawlessly. River Terrace Inn will provide exceptional accommodations for your guests, and catering is provided by Restaurant Cuvée, from which a delectable menu composed of regional community produce will be personalized for you. Create a signature cocktail with bartender Austin Thompson and you’ll guarantee a night your guests won’t soon forget. For the bride who believes in organic living, Gabrielle provides the perfect gifts of sustainability. Favors could include any combination of its organic line of products (olive oil, lavender-infused honey, bath salts, body wash, lotions, essential oils and more), created wholly from the ground upon which your guests are mingling.